Every single part and every single feature of SIMGallery 5.0 will display, beautifully, on every device type: smartphones, tablets, and desktops. Just like on Facebook, clicking on links to Photos and Videos will display on a popup. As you browse (without the need to load a new page), the URL on the browser will change accordingly, so your users can share links easily by simple copy and paste. Once a new photo has been added/selected, a cropping modal will appear where you can choose to crop out a part of the photo and set as your profile picture. Previously, SIMGallery only supports single-level categories. Now you can have up to 3 levels of categories/sub-categories. Mouseover any user's names to see how it works. Delays and slow page loading due to lengthy multiple database queries have been completely removed. Pages load much faster now. Modules and plugins display images beautifully now, with theater mode working with all of them. It is really difficult to appreciate these improvements by reading about them. I strongly recommend testing out the full demo to see how everything comes together. You need to login to create your own albums and upload photos. As Joomla 2.5 is nearing the end of its support life cycle, we have decided to drop support for it. In the months to come, we will begin to release updates for our other products without support for Joomla 2.5. 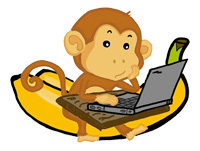 If you need assistance upgrading your website from Joomla 2.5 to Joomla 3+, feel free to send us an email. After all, we just upgraded our own, and it was quite an undertaking. ProfileURL now works perfectly on mobile devices. We have added support for EasySocial groups, SIMAnswers dashboards, and Kunena user profiles. Keeping in line with Joomla's roadmap, we have switched to jQuery. We actually started the change with SIMAnswers (most people didn't even notice this), and will be proceeding with our other extensions in time. For a full list of extensions supported by ProfileURL, please check out the documentation page, or go straight to the live demo (requires login)! 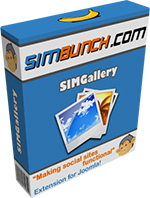 SIMBunch is now on Joomla 3+! Finally, we are here. It's been ages in the making, but we had to do it. It took us so long only because we have so many 3rd party extensions that we have modified through the years, and the only way is to create Joomla 3+ compatible versions of them ourselves - every single one of them. 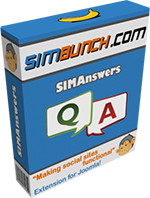 Nevertheless, SIMBunch is now on Joomla3! If you come across any broken links on the site (we've checked thoroughly, but just to be sure), please do me a huge favor and let me know. BIG news: SIMAnswers has just undergone a COMPLETE OVERHAUL - and oh boy what an upgrade!! Packed with a ton of new features, streamlined user processes, and beautifully designed, SIMAnswers can be used as a Questions & Answer solution, a Forum, or even a Support Ticket system. Read on for the loooooooong list of new features and changes! We are having a Thanksgiving/Black Friday sale at SIMBunch. Use the coupon code SIMAWESOME to enjoy 20% off all purchases, from now until December 2nd! Great opportunity to spread the holiday cheers with ParaInvite, upload holiday photos with SIMGallery, or be the first to grab the all new SIMAnswers, to be released in a week!! Our friends at Ready Bytes are also having an amazing holiday sale. Enjoy flat 33% discount on all products with Ready Bytes with the coupon code PPBUNCH3DAYS33, valid from now until December 2nd. Great time to start selling with ReadyBytes e-commerce extensions! 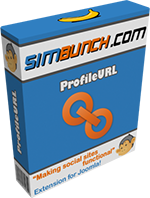 ParaInvite 5 revolutionizes viral marketing for Joomla!